The SM517 robust windshield and dashboard car mount holds smartphones up to 5.2” tall, including the iPhone 5, 5S, 5C and all previous iPhone models (such as the 4S and 3G), LG Optimus G, Nokia Lumia 1020, and Motorola Moto X. It also holds midsize (7” screen size) tablets, including the Galaxy Tab 3 7.0, Kindle Fire HD, and Google Nexus 7. 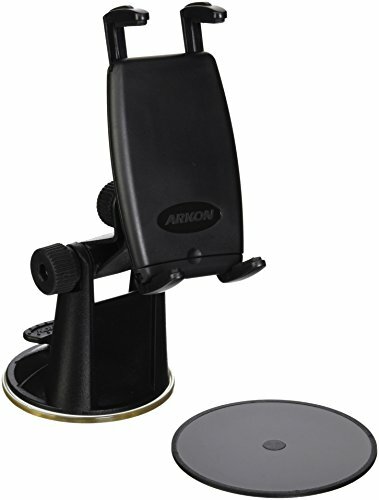 This mount package includes Arkon’s Slim-Grip Universal Holder, a large-sized 80mm windshield suction car mount base with one-touch lever, and a circular 3M adhesive mounting disk (for optional dashboard mounting). The Slim-Grip’s spring-loaded mechanism makes it easy to insert or remove the tablet from the holder with one hand, yet still holds the device securely. Included with the holder are 8 support legs (4 short and 4 longer versions). The top and bottom adjustable-leg design of the Slim-Grip helps keep any side buttons and ports unobstructed. The recommended configuration for best performance for most devices is to use the 4 short legs on the top of the holder and the 4 long support legs on the bottom of the holder. The arm of the suction mount adjusts vertically and provides 360° rotation, giving you the ultimate flexibility in viewing the tablet from any angle. The 5” tall robust suction car mount with Slim-Grip holder can also be used as a dashboard mount. It’s a 2-in-1 tablet car mounting solution. For mounting tablets with larger than 7” screen size or for Samsung Galaxy S5, Galaxy Note 3 and Note 2, Galaxy Mega, LG G2, or Motorola Droid MAXX, Arkon recommends Model SM617, featuring the new Slim-Grip Ultra Universal Smartphone and Midsize Tablet Holder (also available from Amazon).